Demand for industrial valves in the US will rise 4.9 percent yearly to $19.8 billion in 2018. The construction market will grow the fastest, as both residential and nonresidential segments rebound at double-digit rates. However, process manufacturing will remain the largest valve market. Demand for automatic valves will outpace standard valve sales. 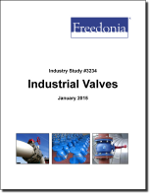 This study analyzes the $15.6 billion US industrial valve industry. It presents historical demand data (2003, 2008 and 2013) and forecasts (2018 and 2023) by material (e.g., steel and steel alloys, copper-based, iron, plastic), product (e.g., multiturn, quarterturn, application-specific, safety and relief, control, regulator, automatic actuators), and market (e.g., process manufacturing, utilities, resource extraction, construction). The study also considers market environment factors, details industry structure, evaluates company market share, and profiles 34 industry players, including Emerson Electric, Cameron International, and General Electric.